Recently I have been noticing a growing number of local corn fields are showing "top dieback" or the death of the top leaf (or leaves) of the corn plant. This can happen due to several causes. The cause that is worrying me and that I am noticing is a few scattered fields caused by Anthracnose. 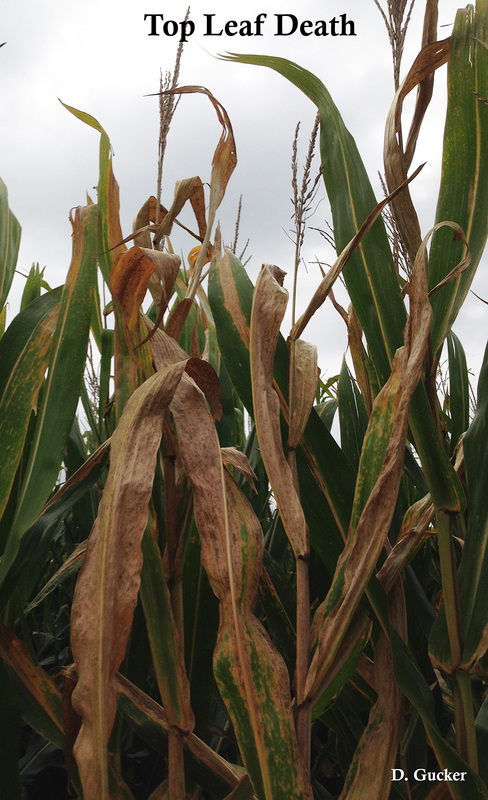 If the corn field is showing leaf death at both the top and bottom, this can be the typical dry down (leaf senescence) pattern of some corn varieties or caused by an environmental stress that is shortening the plant's growing season. Insects attacking the upper part of the corn plant will cause a top dieback. This damage is from the tunneling of the European Corn Borer or the Southwestern Corn Borer. If this is the cause, you will notice a hole in the upper stalk where the insect entered the plant. Finally, and the reason for this article, is the fungal disease, Anthracnose. This disease can infect the plant early in the growing season before tasseling (and fungicide application) and it stays dormant till a late season plant stress triggers it to break dormancy. Anthracnose will typically show up initially as scattered plants within the field showing the upper flag leaf turning yellow, purple or dead. 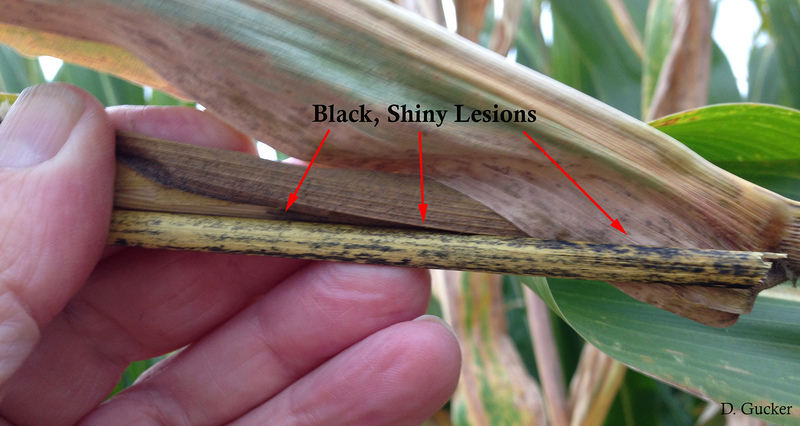 If you suspect that Anthracnose is cause, then peel back the leaf sheaf of the affect flag leaf to expose the stalk and look for its typical black, shiny lesions on the dead stalk. If you were to split the stalk of this plant, you would notice discoloration of the upper stem nodes. If a majority of the field has "top dieback" caused by Anthracnose, this field should be scheduled for timely harvest. This is because it is more susceptible to a stalk rot caused by the same fungal disease. For more information, you can read articles by: Alison Robertson from Iowa State University entitled "Top dieback in corn: Is anthracnose the cause? "; or Bob Nielsen from Purdue University entitled "Top Leaf Death or 'Dieback' in Corn".